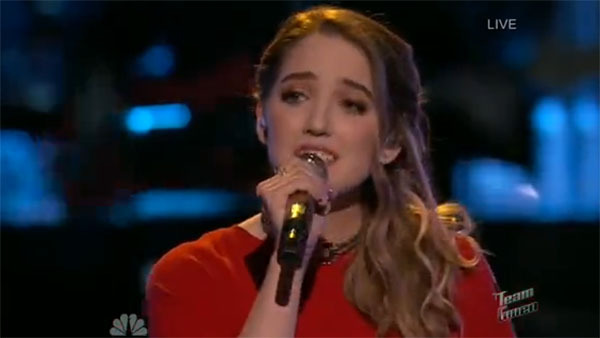 Korin Bukowski from Team Gwen sings ‘Adia’ by Sarah McLachlan on The Voice Season 9 Live Playoffs, Monday, November 9, 2015. “That was so cool. I heard new things in your voice, a lot of strength that I never heard before,” said Adam Levine. “Great job connecting with that song,” said Blake Shelton. “You are so beautiful. To see you tonight to embrace the song and giving it with your own twist and personality, it was so beautiful and emotional. You just grow right before our eyes,” said Gwen Stefani.